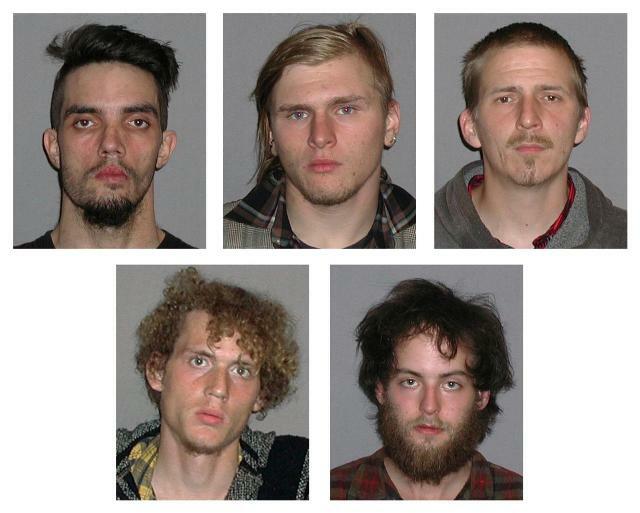 CLEVELAND — In true Occupy anarchist form, 5 men, all tied to the Occupy Movement, were arrested hours before May Day (May 1st) for plotting to blow up the Route 82 Brecksville-Northfield High Level Bridge that spans the Cuyahoga Valley. The 5 men are: Douglas L. Wright, 26; Brandon L. Baxter, 20; and Anthony Hayne, 35, who were arrested by members of the FBI’s Joint Terrorism Task Force the evening of April 30th, on charges of conspiracy and attempted use of explosive materials to damage physical property affecting interstate commerce according to the federal indictment filed in the U.S. District Court, Northern Ohio District. Two other men, Connor C. Stevens, 20, and Joshua S. Stafford, 23 were also arrested under the same charges, but were not listed as major players in the plot. The plot was closely monitored by the FBI and two confidential informants. One of those informants sold two non-explosive duds the suspects believed to be improvised explosive devices (IEDs) containing fake C4 for an agreed price of $900. The plan was made to place the devices on the bridge on Monday, April 30th and detonate them later that night. The details of the plot and conversations with the purported leader of these men, Wright, is detailed in the indictment, which is an incredible read. Details about how Wright planned to riot in the streets using the “black block” technique, creating diversions for the police, then knocking the bank signs off the top of Cleveland buildings. The main conspirator seems to be Wright, as he is the main subject in the indictment and the focus of the informant. But it’s the other two men that were arrested on conspiracy and attempted use of explosives that really raise the eyebrows. 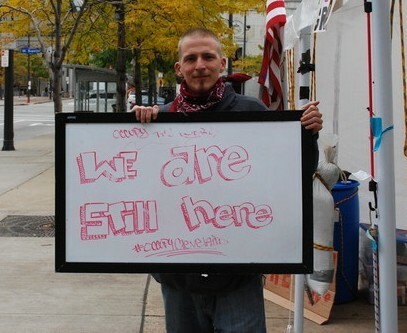 Baxter is a self-proclaimed anarchist (much like the other fine gentlemen arrested) and was captured by a Cleveland photographer at the Occupy Camp in Cleveland. In the picture caption, Baxter is described as an “Occupy Organizer”. Neighbors of Baxter told NewsNet 5 in Cleveland theywere “not surprised” Baxter had been arrested for a crime andcalled him “eccentric”. 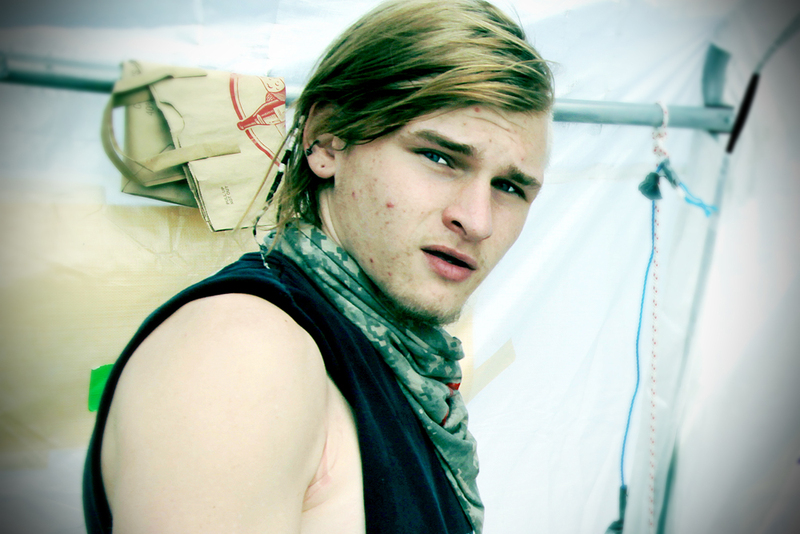 Hayne has deep ties with Occupy as an organizer and recruiter. In an article by a local E-News organization, the Lakewood Patch, Hayne is described as an organizer. “I just want to be very clear: we are not occupying Lakewood,” said Hayne about the recruiting booth outside a local pizza restaurant in Lakewood. On Thursday this week (May 3rd, 2012) all 5 men were indicted by a grand jury on their 2 charges, and a new charge that was added: Attempted use of a weapon of mass destruction to destroy property in interstate commerce. All five men could face life imprisonment for their involvement, if convicted. Of course, ‘Occupy’ calls this an isolated incident. Completely ignoring violence in Seattle, Portland, San Diego and countless other places. History dictates that this is only going to get worse. These 5 men were thwarted, but what about the next group? The threats keep coming, and eventually they’re going to follow through. What’s Obama said on this? Nothing… Apparently he’s still standing by his support for this anarchist movement. But this shouldn’t come as any shock to anyone out there… After all, he plans on being president for another 64 years! If that doesn’t make you shudder, I don’t know what will. « MUST WATCH: Shocking Documentary – Rumors of War: Target U.S.